Many brides and grooms who come to the legendary “Lake of the Sky” with thoughts of matrimony often have a vision of the perfect setting where they’d like their event of a lifetime to take place. Several exceptional wedding locations frequently chosen by couples are described below. 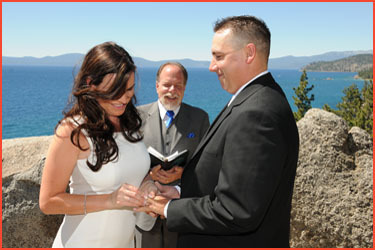 The listed ceremony sites detailed here are conveniently situated around the southern edge of Lake Tahoe. Aside from their natural beauty, these venues are distinctively different, each providing a unique setting that’s imparted with amenities that may be of particular interest. Review a complete list of all of our wedding locations. 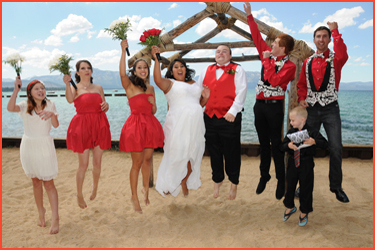 The waterfront location of Lakeside Beach is voted as one of the best wedding venues on the south shore of Lake Tahoe by many brides and grooms who have previously married there. If you want to exchange vows and rings with toes in the sand aside a brilliant, varicolored lake with magnificent towering peaks looming in the background, this superb beach is the place to do it. Impressive views, though, is not all Lakeside Beach has to offer. Private and exclusive use of the eye-catching beachfront area is afforded to you and your guests, and the spacious area of this alluring and placid setting can comfortably accommodate large parties. Seating is included with your reservation, and the wooden arbor that’s advantageously placed at the water’s fringe where the ritual takes place is part of the striking backdrop, and it can optionally be decorated to suit your liking. Edging the border of Nevada, this ceremonial site is convenient to town, making it expediently accessible on your wedding day. Compellingly endowed with an abundance of amenities, Lakeside Beach is assuredly one of the most popular ceremony venues in South Lake Tahoe. Adjacent to the lake, the park-like setting of Regan Beach is slightly elevated above the shore and overlooks the water. Maintaining a plethora of impressive amenities, this beautiful wedding venue has comparable grandeur to that of its rivals. Aside from its aesthetic attributes, a vastly favorable feature Regan Beach enjoys in comparison to other neighboring beach venues is that it’s available year-round. The grassy knoll area can be reserved for private use during the summer months and is able to accommodate very large groups. Seating for guests can be furnished and adornments, such as an arch or floral arrangements, can be electively added. With the nearby shoreline only steps away, the bride and groom are given the option of having an intimate photography session on the beach after the ritual concludes, which is another appealing trait of this ideal site. 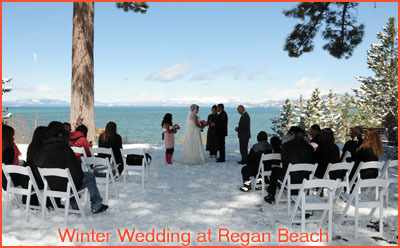 Because it is centrally located in the heart of South Lake Tahoe, Regan Beach is easily reachable throughout the changing seasons. Hosting your special occasion at this magnificent locale can be a formal affair or simple and intimate. The attraction to Emerald Bay is immense, and couples who experience the thrill of marrying on the bluff are in awe of the remarkable beauty that poses in the background as the setting for their wedding day. The picturesque scene is the panoramic view of the 72 mile circumferential shoreline of Lake Tahoe, viewed from a bluff towering 300 feet over the water. The surrounding grandiose Sierra Nevada Mountains further accentuate the natural beauty of the lake and the neighboring area of Emerald Bay. Providing such a natural setting of exquisiteness with considerable romantic appeal, it is not a mystery why this secluded area of Emerald Bay is a top choice for scores of brides and grooms who want to consummate their wedding vows. The experience of a wedding at Emerald Bay will be one that will create a lifelong memory that the married couple will forever treasure, a lasting impression of a very special day in their lives. 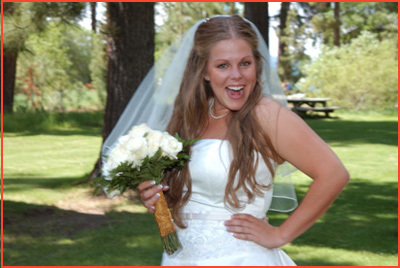 One of the most beautiful wedding locations on the east shore of Lake Tahoe is Logan Shoals Vista Point. The vista at Logan Shoals is one that rivals Emerald Bay, consisting of an elevated ceremony site that provides a panoramic view of Lake Tahoe as far as the eye can see. Perched high above the water in a private, rocky nook, you’ll be amazed at the beauty that surrounds you as you exchange your vows and rings during your marriage celebration. Weddings are performed year-round at Logan Shoals and are best suited for small, intimate weddings. This location is easily accessed from the main highway, and the actual site where the ceremony is conducted is only a short jaunt along a paved walkway. Enriched with a relaxing and serene atmosphere, Logan Shoals is a perfect place to celebrate a very special day.